On Saturday morning I was invited to go along to Miss Patisserie's Spring event. If you live locally to Cardiff or if you ever visit the city, please give Miss Patisserie a visit in the High Street Arcade. The store is beautiful, you are welcomed in by a subtle spring scent wafting over from their selection of candles and you can't take your eyes off of all of the pastel colours and bath bombs. This was my second event here and the store had changed a little but there was so much more space now and so many more products to try out! I said "Hello" to a few of my friends who were already inside and then I could not stop taking photos! Everything was so immaculate and even though there were quite a few of us in there I found it quite easy to move round the store and take photos as well as standing and having a good sniff and nose at all the products. Unlike some other shops, I feel there is enough space in Miss Patisserie. This may sound like a really random thing to comment on but when you are buying skin care or perfume you want to be able to read what ingredients are used and understand which product is best for your skin type instead of feeling squashed and rushed into buying something. One thing that really caught my eye and that was possibly because Holly and Hannah had already picked some up, was the 'Bath Shards'. These big, sparkly, colourful shards melt and fizz away in your bath. These shards are filled with cocoa and shea butter so they will leave your skin feeling silky smooth. Also, you can break pieces off so you don't use it all in one go which is perfect! Next, I found Charlotte who founded Miss P in 2009 and who is extremely helpful and knowledgable about the products which is no surprise since she is a trained aromatherapist. I was really interested in the 'Coffi Scrubs'. There were 3 scents to choose from and I went for orange. After wetting my hands over the sink, Charlotte poured a little of the coffi scrub onto my palm and then I rubbed it all together. No joke, my hands have never felt softer! It wasn't too "scrubby" and rough, it was just the right amount. 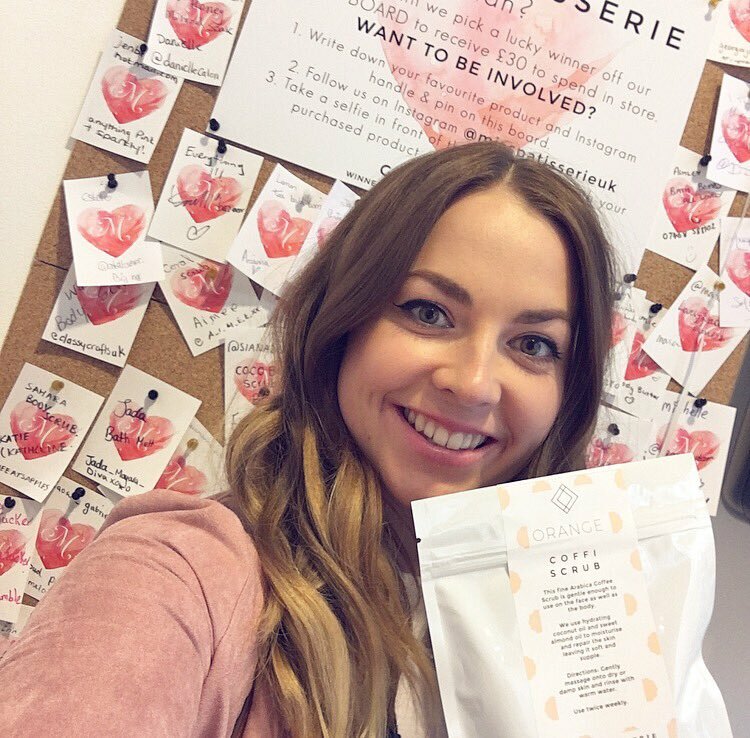 Although Charlotte said that because I had eczema, the sugar scrubs would have been great because of how moisturised they leave your skin feeling after I could not get over how amazing the coffi orange scrubs smelt! Plus, you could use it on your face too which was an added bonus. Finally, I found myself over by something new. The 'Shower Steamers'. I have always lived in a house with a bath in it, even throughout Uni, so I've always loved using bath bombs but, if you do not have a bath but still want to have some relaxing time these shower steamers are the way to go. Charlotte and Jorge told me that they are filled with essential oils. Each one is different and can include ingredients which can relieve you of daily stresses, headaches and even help with anxiety. I didn't want to spend too much on Saturday so I didn't buy any of these but it is definitely something I will be picking up next time I am in Cardiff. Plus, just like the 'Bath Shards', you don't have to use it all in one go. Charlotte told me that she cuts hers in half and just lets it steam away in the shower-perfect! I could honestly comment on every product on sale in Miss Patisserie from perfume to bath bombs to soaps! There is so much choice and with such knowledgeable staff in there you really know you will be getting the product that is right for you. Here is their website if you don't live close to Cardiff or stockist but still want to purchase or have a look at their products! Thank-you once again for having me and for my little goody bag. I really enjoyed my experience and I cannot wait to come and visit again! I hope that you enjoyed reading this post, let me know if you were there and what you bought! Nice post Jade - enjoyed learning about Shower Steamers. I haven't had a bathroom with a bath for 12 years so always feel a bit left out when it comes to indulgent soaking "me-time" but having something lovely for a shower is great. Just wish I lived in the UK to pick some up! Thank-you! I know, I hadn't seen them anywhere before either so i was really interested too. I'll let you know if I pick any up and if we come to visit you then I will bring some along!